● Check engine oil, engine coolant, and windshield washer fluid. Add when necessary. ● Check brake fluid and clutch fluid. ● Check the battery condition monthly. 1. Pull the hood release handle under the corner of the dashboard. 2. 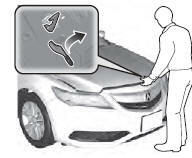 Locate the hood latch lever, slide the lever and lift the hood. 3. When finished, close the hood and make sure it is firmly locked in place.